BELOW ARE DETAILS OF LAST YEAR'S TOURNAMENT for your reference. FULL DETAILS including Invitation Letter & Entry Form will be available from October 2017. We hope those teams who came in May will be joining us again, together with some new faces too - it is one of the best orghanised Tournaments in Oxfordshire - ask anyone who has been to one. 90% of teams return every year. please visit the LATEST NEWS PAGE by clicking here. You don't want to miss out on getting a real bargain ! JUST A FEW spaces left in some age groups for late entries. MUST CONTACT GLENN (see below Update 2 for contact details) AS SOON AS POSSIBLE and BY FRIDAY MORNING AT THE VERY LATEST - after that, fixtures are finalised and the programme goes off to the printers. Glenn is working abroad this week but returns on Thursday afternoon. He apologies if you have contacted him regarding a possible late entry and he has yet to reply. He will do so by Friday evening at the latest. He thanks you for your patience. Now up to 160+ teams . . . . but still a few spaces left in most age groups for late entries. MUST CONTACT GLENN (see below Update 2 for contact details) AS SOON AS POSSIBLE and BY NEXT THURSDAY AT THE VERY LATEST - after that, fixtures are finalised and programme goes off to the printers. All Age-Groups are FILLING UP VERY FAST as last week I was receiving around 5 more each day. We are now up to 127 entries, which is 10 more than at this stage last year. We ended up with 173. As with some from our own club, a lot of managers of other clubs don't enter until the last minute. Last year I had 35 teams enter the week before the closing date and another 20 the following week. Please don't be one of those who has left it too late - had to refuse 7 late entries last year as their age groups were full. FRIDAY 28th April & provided I receive it by Friday, you are guaranteed to be accepted. However, I can accept late entries if spaces available - need to phone me from next Tuesday 2nd May. NB: I cannot accept any entries whatsoever after Friday 19th May as the programme with teams/fixtures will be off to the printers first thing on Monday morning. FOR FULL DETAILS of our TOURNAMENT, scroll down. Under 9s, Under 11s and Under 12s. We can accept 21 teams in each age group, but if one or two are less, we could go up to 24. At the present time, we have about 25 more teams entered than at this stage last year - we ended up with 173. So please get your entries in as soon as possible to avoid disappointment - we had to refuse 7 late entries last year. The official closing date for entries is FRIDAY 28th APRIL but if space, Glenn can accept late entries - need to phone him. FOR FULL DETAILS including entry form and rules, see below. In 2016, we had 173 teams participate over the weekend, playing 618 matches altogether. As almost ALL age groups last year were full, and it is anticipated there will be an even greater demand for places this year, you are advised to get your entries in early. As we have the tradition of giving all teams who enter a reasonable number of 8 minute games (10 minutes for older groups) - minimum of 5, most 6 or 7, and some 8 or 9 games, the maximum number of teams we can cater for in any specific age group is usually 21. If any age groups have less than 21, then other groups could possibly go up to 24 teams. Please click on the links below to download them. ​which teams attended and the number of games played. A REPORT together with RESULTS of all age groups and including the Raffle Prize Winner, was posted on this website at the end of June. It will be found in "PREVIOUS TOURNAMENTS" page near the bottom of the left menu bar. 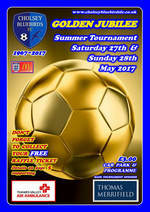 It should be pointed out at this time, that 2017 will be our GOLDEN JUBILEE and we hope to have some special events taking place during the season, and especially at our 2017 Tournament on Saturday 27th & Sunday 28th May. Thank you for letting me referee at your tournament again this year, it was a great weekend and I look forward to next year already. Hoping I win on the raffle. Good morning, thank you for having us at your tournament, it was a pleasure and a privilege to be part of it and would like to come again. Hi. Just to say well done for such a great event. Congratulations to all the family! organised and what a performance by Dave Evans collecting money for raffle tickets! Me and my three boys had a great time. Best wishes and see you next year. Thank you from Goring Robins Under 9’s for once again for the organisation of a great tournament. Just wanted to thank you all for a great weekend of football as we have all thoroughly enjoyed it . . . again. ​If there are any other managers, players, referees or parent supporters viewing this page who came last year (and/or previous years), we would be delighted to hear your comments - good or bad - about our Tournament. We think it is a fantastic and well-organised weekend, one of the best in Oxfordshire, trying really hard to ensure everyone goes home at least with some happy and enjoyable memories - perhaps a trophy too, and, of course, a full stomach as well !